Paragon at Columbia Overlook, a Chesapeake Realty Partners apartment community in Columbia, Maryland, received three top honors from the Maryland Multi-Housing Association (MMHA) at their annual Star Awards ceremony held on October 22, 2015. "Our location, design and top-notch resident services all add up to 'Best Property' recognition", said Josh Fidler, Co-Chairman of Paragon at Columbia Overlook’s owner Chesapeake Realty Partners. "We will continue to work hard to justify this award." 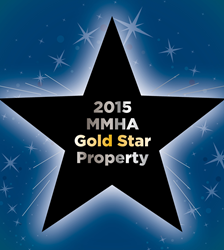 Awarded annually since 1997, the MMHA Star Awards recognize and honor members who exhibit the most outstanding and innovative properties and professionals in the Maryland multi-housing industry. Nominations are accepted from among the organization’s more than 200 associate members and nominees are judged by a committee of third-party professionals, not affiliated with any of the management companies. “We are extremely proud of the team of professionals whose efforts have made Paragon at Columbia Overlook stand out among such tremendous competition," said Len Frenkil, President of the community's management firm, WPM Real Estate Management. Paragon at Columbia Overlook features spacious apartments with 9 foot ceilings, granite countertops, high-end wood cabinetry, and upgraded flooring. Paragon at Columbia Overlook also offers a unique set of amenities to its residents that are tailored to the active lifestyles of the surrounding community including a first-class Resident's Club, a 24/7 fitness center with on-demand, virtual fitness classes, a saltwater pool, a greenhouse and an Adventure Center. The Adventure Center features an area to repair bikes and provides storage for kayaks and canoes. The community is also pet-friendly with a bark park and pet-washing station to please residents' four-legged friends. In recognition of today’s environmental sensibilities, Paragon has been built to NGBS Gold standards. In order to be certified, the community was required to achieve high standards for building construction, heating and cooling systems, appliances, hot water heating, lighting, and indoor air quality, just to name a few. For more information about Paragon at Columbia Overlook, please visit the website, ParagonColumbia.com or contact the leasing center at 410.312.0500. Headquartered in Owings Mills, Maryland, Chesapeake Realty Partners builds on more than 65-years of success in the Mid-Atlantic real estate market. CRP is actively engaged in all aspects of real estate development – land acquisition; land planning and land development; residential lot sales; construction and operation of residential rental communities; and construction and operation of commercial properties. Recent award-winning apartment communities include Winthrop (295 units; Towson, MD); Paragon (320 units; Columbia, MD); and Bainbridge Fair Lakes (150 units; Fair Lakes, VA). For additional information about CRP and its projects, go to ChesapeakeRealtyPartners.com. WPM Real Estate Management is an Accredited Management Organization® (AMO®) that provides property management for over 18,000 homes and 35,000 people in the Baltimore/Washington Metropolitan area. The company's primary focus is residential: multifamily, condominium, senior housing, student housing, and homeowner association communities. WPM has topped the list of leading residential managers in Greater Baltimore, ranked by local units managed, as compiled by The Baltimore Business Journal for 3 straight years. In addition, it has an extensive managed portfolio of commercial, industrial, and retail properties. WPM has been recognized as one of Baltimore's Top Workplaces by The Baltimore Sun, ranking among the top 5 large employers in both 2012 and 2013. The company employs nearly 500 employees, with 80 at the corporate headquarters in Owings Mills, Maryland and more than 400 at various on-site locations. For more information about WPM Real Estate Management, visit the WPM website at WPMLLC.com.